Most colorful pol in US ready to run again for office! God bless you, Buddy Cianci. Cianci –– former mayor of Providence, RI, current radio talk show host, and convicted felon – says he may get back into politics. Cianci says he may run against either Rep. Patrick Kennedy (D-Carpet Bagger) or current Mayor David N. Cicilline (the only gay Jewish Italian mayor IN THE WORLD!). Buddy is an astute observer of politics and he notes there is a strong anti-incumbent feeling out there. This feeling is running even higher in the Bay State which has something like a 13% unemployment rate. (Top that Michigan!) To outsiders it would seem that even that wouldn’t be enough for Cianci to get elected. They would be wrong. Outsiders get all hung up on the fact that Buddy left office in disgrace not once but twice. In 1984 he resigned the mayoralty after pleading no-contest to charges of kidnapping and assaulting Raymond DeLeo with a fireplace log, an ashtray and a lighted cigarette. Cianci believed DeLeo, a long-time friend, was having an affair with the mayor’s estranged wife. This assault was witnessed by Cianci’s police chauffeur, his divorce lawyer, the Providence director of public works and a former state attorney general. But that’s ancient history. Outsiders get it wrong because if you haven’t lived in RI you have no idea how weird it is. It is Fellini meets Terry Gilliam only weirder. If Buddy runs do not bet against him. He has lost only one election that I can think of. 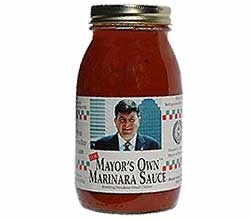 His pasta sauce, The Mayor’s Own Marinara, is still sold throughout the state (and if you want some amusement google “Rhode Island gift baskets” and look at the contents).He remains popular with the electorate because he probably knows all of them. As Providence Journal columnist Bob Kerr told me, “I always remember there’s the friend of mine who’s a Cambodian guy – he came here, survived the killing fields. Did the classic American struggle, went to school and went to college, became a school counselor and then he got his master’s degree. On a hot summer afternoon in South Providence in this guy’s backyard, they were celebrating his master’s degree with some Cambodian food and a few friends and up comes the limo and out gets Buddy with a proclamation. … And that’s him, he’s always doing stuff like that.” During his times in office it was widely believed that Buddy would attend the opening of a door. Sadly Kennedy’s seat is probably safe. Buddy would be bored out of his mind in Congress and he knows it. But if he runs for mayor his only opposition will be the good government types who are ethically right and about as interesting as a damp sponge. Also in Buddy’s favor is the “he can’t be any worse than what we already have” factor. If I still lived in RI, I’d vote for him in a heartbeat – he may not always provide bread but he excels at circus.